I am from the city. I’ve lived my whole life in cities. But I love the country. When I moved to a tiny town to attend college, I had never been away from the city and thought I would hate living 45 min. from the nearest “civilization”. But, oh, I was so wrong! I fell in love with quiet evening walks, the slower pace, the friendliness in the people, the absence of traffic & honking horns. I enjoyed all the trees and birds, and wildlife that was all around. Yes, I definitely fell in love with the country. …Sigh …And I’ve never gotten over it. I even enjoy the chickens. This pretty chick had several friends with her, several different kinds. I’m not familiar yet with the different varieties but they were all beautiful. I had fun just watching them and having a photo shoot of my own. Maybe when we move to our new place I can have chickens?! Fun!! I was born and raised in the city, too, and when I was 49, I remarried and moved to the country. I loved the scenery and quiet, but I never quite got used to septic tanks, cisterns and propane gas. We had to move after 20 years due to my husband’s health and now I’m back to suburban living and enjoying it while having nice memories of living in the county. Love the picture of the chicken. I’m so glad you like the chicken! She is a beauty. Nice photo! 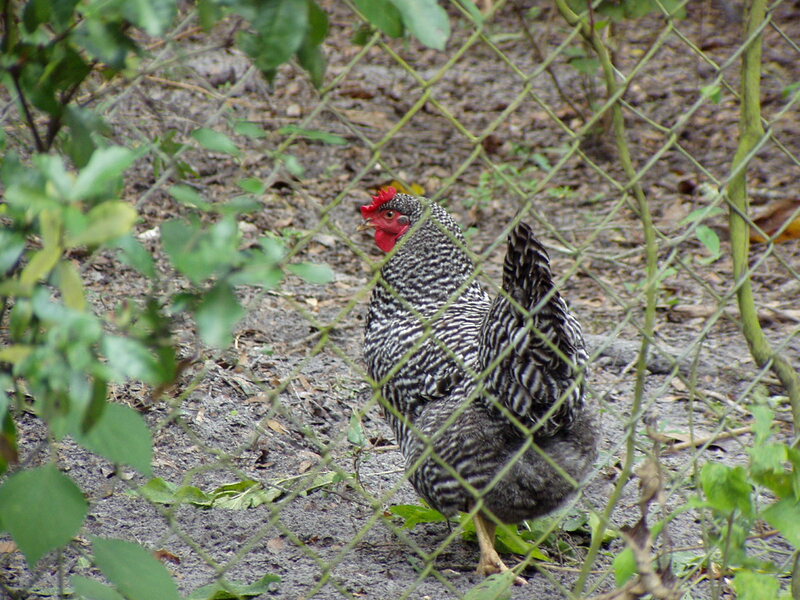 I believe that hen is a Barred Rock. We had some when we lived in the country. I can be happy in town or country, since they both have their pros and cons.